The day of the bride…Saint Brigit’s Day…Imbolc. The darkest part of the year is over. Imbolc is an ancient Celtic festival, the festival of lactating sheep, marking the midpoint between the winter solstice and the spring equinox. Traditionally, in addition to blessing seeds and agricultural implements, it was a time of weather divination, watching to see if serpents or badgers came from their winter dens, and if spring would come early. Here in North America, we will be watching for a groundhog. It is also the feast day of Saint Brigit. Prior to Christianity, Brigit was a goddess. St. Brigit is the patroness saint of Ireland. Her story is long and varied. Foods associated with the day include oats, milk, bread, and ale. One of her legacies is the Brigit’s cross. 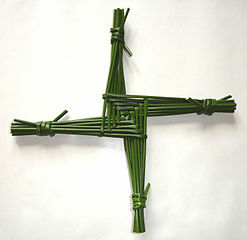 The cross is made from rushes and hung to protect homes from fire and evil. Paying a bit of attention to these ancient Celtic cycles, rather than making me feel otherworldly, actually makes me feel more connected to humans (albeit ancient ones). While I will not be firing up a cauldron to cook my oats this evening, I will light a candle and raise a glass of ale to Brigit. This entry was posted in Uncategorized and tagged ale, candlemas, groundhogs day, imbolc, st. brigit on February 1, 2015 by elizabeth. Slicing open an avocado for breakfast prompted a conversation with my husband about whether an avocado seed is the largest seed among seeds. I ventured that coconut might be, but was uncertain. So, after some quick research I discovered that the avocado and the coconut are indeed among the largest of the world’s seeds. But there is another, spectacularly large seed, a 12” seed that can weigh 40 pounds- the coco de mer. Imagine dealing with that on the kitchen counter while you make toast and tea! 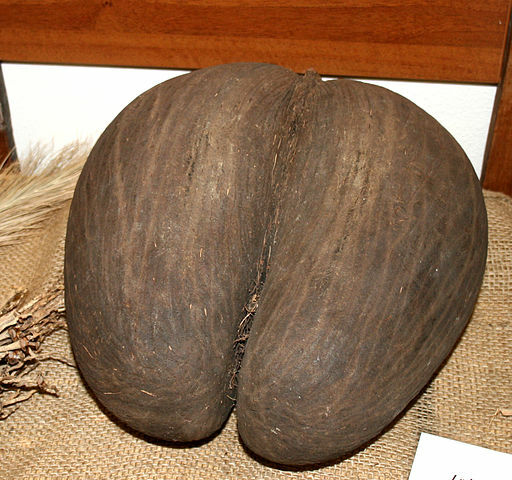 It is the seed of a very rare palm tree (Lodoicea maldivica), found only in the Seychelles Islands. (The Republic of Seychelles is so far out in the Indian Ocean, that I had to zoom out many times on Google maps to learn that the closest land is the mainland of Southeast Africa.) No wonder it is rare, no wind or bird can carry that seed anywhere. The coco de mer seed is so rare that it is protected as a Natural World Heritage Site. Yes, a site. You have heard of World Heritage Sites, which include buildings and places; well a natural site includes flora and fauna such as trees, plants, ecosystems, and even seeds. I loved learning about a new seed this morning. Let me know if you encounter any large seeds today. 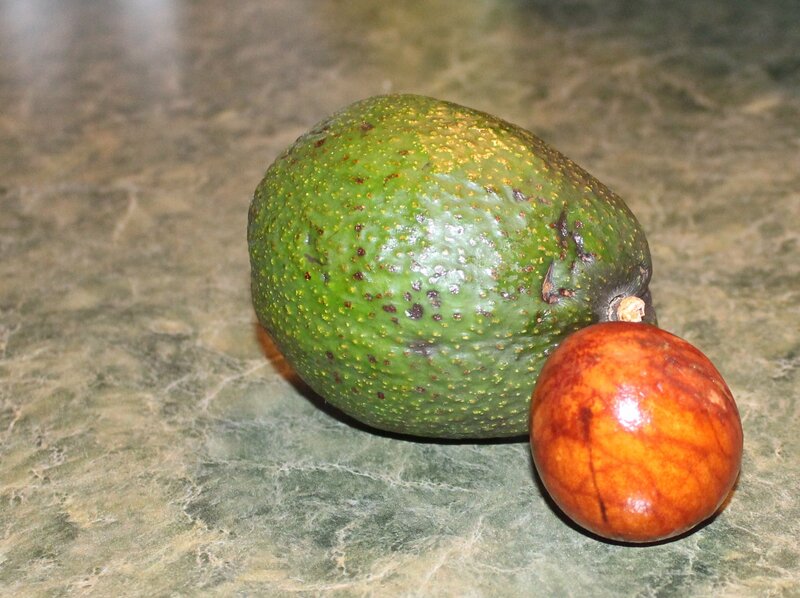 This entry was posted in Uncategorized and tagged avocado, coco de mer, large seeds, lodoicea, palm seed, republic of saychelles, seychelles on January 29, 2015 by elizabeth. The big blizzard is slamming New England, but down here in western South Jersey, we only got a dusting. But because the predictions were so extreme, school was canceled. And since I work at a school, I got a snow day. I love a snow day, as much as a child; I will wait up late and get up extra early just to watch the school closings ribbon on the television news (despite all the more modern notifications that I receive). Having a snow day means I get all this extra time to work on several projects with looming deadlines. But, here I am blogging (it is my newest passion), and making another cup of tea (a very old passion). In the morning I like a big mug of black tea with local honey and some milk. Several times. Every morning. My sister, and many of my cousins, also loves tea. She frequents tea shops and actually traveled to Sri Lanka to visit tea plantations. I like to think that our love of tea is due to our Irish genome. All tea actually comes from the same small shrub Camellia sinensis. It is different varieties of the plant and different methods of picking and processing it that give us the many styles and colors of tea, like black, white, or green. I have not actually seen a tea shrub in person. I understand that one would not thrive in my area, but I might mail-order one this spring just so I can look at it a little closer. Enjoy your tea today fellow tea-drinkers! 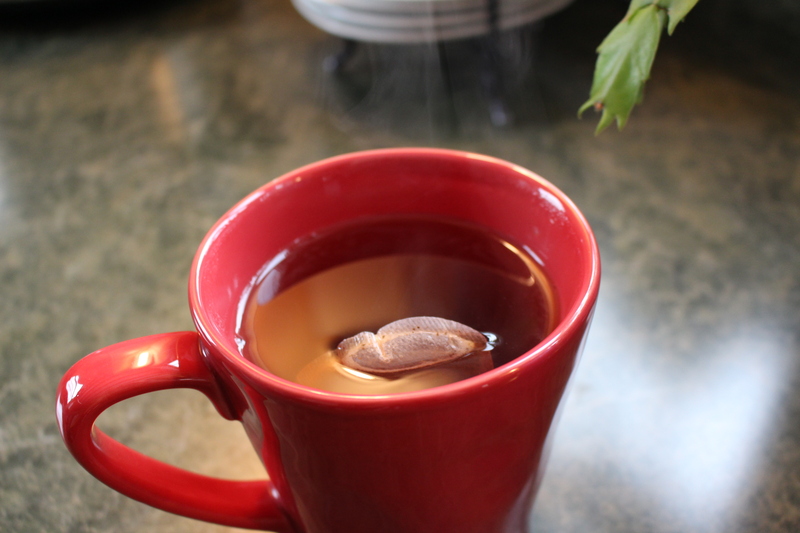 This entry was posted in Uncategorized and tagged camilellia sinensis, cup of tea, Irish, morning tea, snow day, sri lanka, tea on January 27, 2015 by elizabeth. Since the big news around here is the impending blizzard…and I did not want to share another dark, wintery photo today, I decided to utilize The Daily Post’s writing prompt photo challenge. This week it is “Express Yourself”. One of my favorite photography activities is getting very close, extremely close, to my subject. 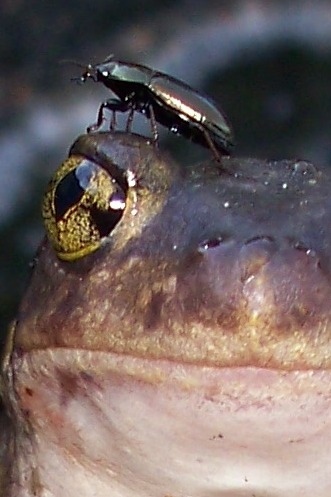 This image of an Eastern spadefoot toad with a beetle on her head is one of my personal favorites. I had a wonderful time taking her picture that day. It is a summer picture, and I hope it will bring a smile to you face and a touch of warmth to your day. For those in the path of the approaching storm I wish you safety and good luck. This little angel serenely watches over the fish wintering in the bottom of my little garden pond. This entry was posted in Uncategorized and tagged angel, pond, simple thing, snow angel, snowfall, sylvia plath, winter, wintering fish on January 24, 2015 by elizabeth. It snowed again yesterday. If you read my last blog about snow, you know that I love snow. It was a beautiful late afternoon snow. A few inches of big thick globs of snowflakes fell quickly, clinging to everything-every tree, shrub, plant, and little winter sleeping buds. Then, right before I went to bed, the National Weather Service issued an advisory for areas of freezing fog. Freezing fog? I had never heard of this phenomenon. So I posted a warning of this potentially dangerous weather on Facebook, and then I googled it. I was already on that, camera ready, I didn’t sleep much last night, every few hours I got up to look outside. This morning brought a winter wonderland, but still no freezing fog. I wonder when a series of weather conditions will bring the chance of freezing fog here again. This entry was posted in Uncategorized and tagged freezing fog, nature, rim ice, snow on January 22, 2015 by elizabeth. January is for thinking about seeds…. January is the month that seed catalogs arrive and gardeners scrutinize them, fantasizing about rows of wholesome vegetables and beds of lavish, maybe exotic, flowers. Yesterday I found these few remaining seeds, stuck in a dried pod, overlooked by the birds and wind. They are of the common milkweed plants I put in my garden last spring, trying to do my part to help the Monarch butterfly. Populations of milkweed and Monarchs are both in serious decline. Common milkweed, Asclepias syriaca, is a host plant for the North American Monarch butterfly, Danaus plexippus, famous for their amazing migratory journey. They will use all species of milkweed, and only milkweed, to lay their eggs, from which the tiny caterpillars hatch and begin chomping away on the leaves. Conservationists encourage us to plant milkweed for the Monarch butterflies. However, it is important to plant milkweed species that are native to your area. Scientists believe that many well-meaning gardeners are planting a readily available, very attractive, non-native, tropical milkweed (Asclepias curassavica). This plant blooms longer, keeps monarchs in northern areas too long, and is detrimental to their life-cycle and health. If you are thinking about planting milkweed, a good place to find out about species native to your area is at The Xerces Society. Monarch Watch, a non-profit organization that focuses on the Monarch butterfly, is another great place for much information about milkweed and the Monarch butterfly. This entry was posted in Uncategorized and tagged asclepias, conservation, decline, garden, january, milkweed, monarch butterfly, seed catalogs, seeds on January 19, 2015 by elizabeth.